In today’s conversation, Hal Elrod is back for round 2 on the podcast! If you’re unfamiliar with Hal and his Miracle Morning book and the morning routine that’s created a movement for millions worldwide, be sure to check out our first conversation, it’s Episode #32. Hal last joined the podcast back in 2017, it was literally his first interview since being diagnosed cancer free. Since then, in addition to finishing his new book (which we’ll dive deep into today), he’s also wrapped up a soon-to-be-released documentary on the Miracle Morning, he hosts his own podcast, speaks for audiences around the world, and flat out stays busier than anyone else I know… and that in less than two years since recovering from a life-threatening illness. Most of what we cover today is on Hal’s latest book The Miracle Equation: The Two Decisions That Move Your Biggest Goals from Possible, to Probable, to Inevitable, which is officially live for purchase today. I’ve already read through, highlighted, and dogeared my pre-release copy and I’m looking forward to sharing Hal’s insights in this conversation. Even better, for those financial advisor authors out there, Hal walks through his behind the scenes book promotion strategy for Miracle Morning and how that’s evolved for his latest book, the best part being that most of it was done with no marketing budget! [05:52] I start today’s conversation by asking Hal, who was NOT an achiever early in life, what changed and how he wires himself to keep achieving. In turn, he shares the story of how he kickstarted his rockstar sales career and uncovered the foundation of what became the Miracle Equation. [14:10] Next, Hal defines what the word miracle really means and the two part framework of the Miracle Equation. We talk about what makes “miracle” such a loaded word and why it’s not a random or passive act, but rather can be a tangible, measurable way to shift your mindset and achieve your greatest goals when you utilize 1. Unwavering Faith and 2. Extraordinary Effort. [30:23] From there, we discuss Hal’s unique “marathon” approach to book promotion and how it differs from most author’s approach of “sprinting” up to the official release. It obviously works as he has reached over 1 million people with his first book which was self-published I might add. If you listen for no other reason than to hear Hal’s unique approach to utilize this very medium of podcasting vs traditional media to maximize your book’s sales and reach, I promise you’ll be happy you did. [35:50] Finally, we get into how to use The Miracle Equation to make extraordinary effort a predictable, ordinary part of your life and how you can translate The Miracle Equation into the real world. [06:23] Hal introduces the Miracle Equation, the power of unwavering faith and extraordinary effort, and how it transformed his life. [09:08] How Hal broke the Cutco Fast Start record despite a total lack of experience and a self-admitted lack of work ethic – and how this showed him the power of the Miracle Equation for the first time in his life. [11:59] Why uninformed optimism often leads us to want to quit – and how to power through it. [18:13] How Hal hit Cutco’s $20,000 sales goal three times in a row – and the shift in mindset that allowed him to hit it the third time with 30% less time to achieve this. [30:23] Hal’s podcast regimen to build up the Miracle Morning – and how his strategy has evolved as he’s promoted the Miracle Equation. [39:21] Why Hal recommends you should be on any podcast that will have you – and why you should aim for smaller podcasts long before you try to appear on high-profile ones. [43:04] Why national television is expensive – but doesn’t move the needle on book sales – especially when compared to podcasting. Thanks for checking out the latest show, on to this week’s featured reviews! Hey Daniel, thanks for listening in and the kind words. Working in this business for over a decade now, I like to say that I get the opportunity to have an accelerated learning curve as I have a 30k foot view of some of the top independent practices from all over the US. So if I’m able to share what works and what doesn’t without you having to trial and error it or waste a bunch of marketing dollars testing unproven ideas, I’m thankful to be in a position to help. Thanks for taking the time to share your thoughts and the review! Appreciate the review and that’s good to hear each show is getting better. Not going to lie, I cringe a bit when I listen to my early episodes, so glad I’m getting better as the show progresses! I’m working on some cool ideas on how to add even more value to the show, including opening up some of our behind closed doors trainings a bit that are typically reserved just for our clients, so stay tuned on that front. Thanks for listening in and for the 5 star review! I’ve found it’s a common theme with the most successful people I know, they tend to be life-long learners and not only that, but they find ways to continue to grow. That often means fitting in podcasts at the gym or on their drive to the office, so well done on that front. Appreciate you taking the time to share your thoughts, more episodes on the way! Thanks for the review Chris! It means a lot to hear such kind words from a 26 year vet and CFP. Even better to hear that our show and lineup of guests is making your business more fun, efficient, and profitable. That’s the ultimate trifecta! Glad you’ve been listening since the early days and as the show grows, it’s crazy to me how new doors are opening to book more incredible guests in the future, so stay tuned and I’ll do my best to keep delivering. Welcome to this episode of the Elite Advisor Blueprint Podcast with your host, Brad Johnson. Brad’s the VP of Advisor Development and Advisors Excel, the largest independent insurance brokerage company in the US. He’s also a regular contributor to Investment News, the Wall Street Journal, and other industry publications. [00:00:26] Brad: Welcome to the Elite Advisor Blueprint, the podcast for world-class financial advisors. I’m Brad Johnson, VP of Advisor Development at Advisors Excel and it’s my goal to distill the best ideas and advice from top thought leaders and apply it to the world of independent financial advising. In today’s conversation, Hal Elrod is back for round 2 on the podcast. If you happen to be unfamiliar with Hal and his Miracle Morning book and the morning routine that’s created a movement for millions worldwide, be sure to go back and check out our first conversation. It’s in Episode 32. Hal last joined the podcast back in 2017 and it was literally his very first interview since being diagnosed cancer-free. Since then, in addition to finishing his new book which we’ll dive deep into today, he’s also wrapped a soon-to-be-released documentary on the Miracle Morning, he hosts his own podcast weekly, speaks for audiences around the world and flat out stays busier than anyone else I know and that’s just in the less than two years since recovering from a life-threatening illness. 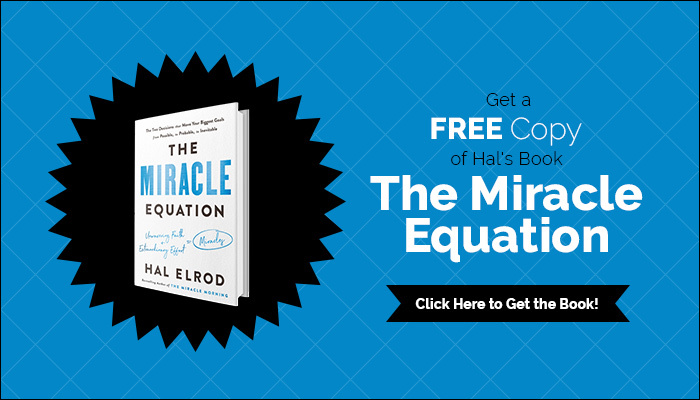 Most of what we covered today is on Hal’s latest book, The Miracle Equation: The Two Decisions That Move Your Biggest Goals from Possible, to Probable, to Inevitable, which is officially live for purchase today. And I’ve already read through it, highlighted, dog eared my pre-release copy and I’m looking forward to sharing Hal’s insights in this conversation. Even better for those financial advisor authors out there, Hal walks through his behind-the-scenes book promotion strategy that worked for Miracle Morning and how that’s evolved for his latest book, the best part being that most of it was done with no marketing budget whatsoever. Here are a few highlights of what we get into today. Number one, I start today’s conversation by asking Hal who was not an achiever early in life what changed and how he wires himself to keep achieving. In turn, he shares the story of how he kickstarted his rockstar sales career and uncover the foundation of what became The Miracle Equation. Next, Hal defines what the word miracle really means and the two-part framework of The Miracle Equation. [00:02:24] Brad: He talks about what makes miracles such a loaded word and why it’s not a random or passive act but rather can be a tangible, measurable way to shift your mindset and achieve your greatest goals when you utilize, one, unwavering faith, and two, extraordinary effort. From there we discussed Hal’s unique marathon approach to book promotion and how it differs from most authors’ approach of sprinting up to the official book release. It obviously works as he has reached over 1 million people with his first book which just so happen to be self-published, I might add. And if you listen for no other reason than to hear Hal’s unique approach to utilize this very medium you’re listening to right now, podcasting, versus the more traditional media way to maximize your book sales and reach, I promise you’ll be happy you did. Finally, we get into how to use The Miracle Equation to make extraordinary effort a predictable ordinary part of your life and how you can translate The Miracle Equation into the real world. Okay. Before we dive into the conversation, one of our biggest gifts yet on our show. First off, Hal and his team sent me a box of his latest book, The Miracle Equation, as a thank you for all of you listening in and I’ll be mailing them out until they’re all gone. Besides just the book, as a pre-release gift, he’s also included $1,347 worth of gives to go along with it. They include Hal’s first-ever online course for The Miracle Equation. It’s a live six-week interactive training hosted by Hal himself, Hal’s guided meditation audio to help you get your day started off right, and The Miracle Equation one-page printable implementation guide. So, here’s what to do next if you want not only your free book but also all of those gifts. Number one, visit the show notes at BradleyJohnson.com/55, that’s 55, where you’ll see an offer to grab a free copy of Hal’s book right at the top. Just click the graphic. From there, you’ll get all the instructions on what to do next but it’s as simple as leaving an honest review out on iTunes for our show. [00:04:23] Brad: You can visit the link BradleyJohnson.com/iTunes to make it easy or if you’re listening in on a mobile app, just scroll down to the Review section. Once you’ve left a review, just drop us an email via brad@bradleyjohnson.com with your iTunes username and the best mailing address to ship your book and we’ll drop you a copy in the mail with directions on how to get all the gives. That simple. As always, all the additional show notes, books mentioned, and people discussed as well as a full transcript of the show can be found out on the show notes as well. So that’s it. As always, thanks for listening and without further delay my conversation with Hal Elrod. [00:05:00] Brad: Welcome to this episode of the Elite Advisor Blueprint. I have special guest, Hal Elrod, back for round 2 here with us today. Welcome to the show, Hal. [00:05:08] Hal: Let’s do this one even twice as good as the first one. [00:05:21] Hal: Yeah. I do love. I think it’s a beautiful one. I like that cover. [00:05:31] Hal: Nice. That makes me happy. That’s an author’s favorite thing to see on their book is dog ears and highlights. [00:05:43] Brad: So, anyway, thanks for carving out some time. This is going to be a fun conversation. What’s really fun actually listen to our last conversation that we did back in 2017 and that was a very different Hal Elrod and that I think was your first podcast back from kind of recovering from cancer and what’s inspiring to me, man, is how much you’ve done since then. It’s like, okay, well let’s get that over with and now let’s just dive in and write a second book, finish up a documentary. So, we can go a few different places here, but let’s just start there like what drives you? And maybe it goes right into the Miracle Equation, but most people don’t do that in a life without recovering from cancer so what’s the wiring that just makes you want to keep achieving and doing these things that impact people all over the world? [00:06:33] Hal: Yeah. It’s a great question. I like that you ask it because I don’t get asked that a lot. Well, first and foremost, I think it’s good to know where somebody comes from and kind of what they were like, you know, to I think one to relate, be able to relate like we all have a point A to a point B, right? Like, we all have where we are and who we are and then we have our full potential like in terms of our life, our results, and just who we are as a person. So, here’s where we are compared to who we could become or who we aspired, who we’re working toward becoming. So, for me, it’s important to like my whole life I was very average. Growing up, I was not an achiever. I have friends. In fact, our mutual friend, Jon Berghoff, he’s the guy that was like a superstar at everything he did. You know, when he was on the golf team, he was breaking records in the golf and it’s like in school, he was a genius. He’s just on and on where I was like this total mediocre kid, class clown, not a lot of confidence, and at age 19 I started in a job in sales selling Cutco Kitchen Cutlery which I was a radio DJ. [00:10:04] Brad: You neutralized it, man. [00:10:06] Hal: Yeah. I didn’t want to look like a total dude and it’s like, “All right. I’ll do it, whatever it takes.” And long story short, 10 days later, and 62 presentations, sales presentations, 90-minute sales presentations so do the math. So, I worked in 90 hours in those 10 days, plus driving about half an hour to each one so two hours so hundred and something hours of work in those 10 days. And the thing is I was a lazy kid my whole life and I share this because it’s that I think Tony Robbins says that. It’s our moments of decision that our destiny is shaped like in the moment of decision where I decided and I committed, I will give it everything I have for these next 10 days to try to break this record even though nothing in my past shows that I have any work ethic that I have any sales ability that I have anything but I’m going to step out on faith. And this really is the first time I use the Miracle Equation even though I didn’t call it that, I didn’t know I was even doing it. The Miracle Equation is made up of two very distinct decisions, Brad, and I know we’ll get into these today. But these decisions are not just for me but if you study the world’s most successful individuals in any walk of life, prolific achievers, and innovators and world champion athletes, every single one of them, I mean, it’s almost universal. It be a really rare case that you find that these two decisions are not fundamental in the way that they live their lives. They’re not one-time decisions. They’re made over and over and over every day that they wake up, every time they face the challenge. These decisions are every time they are faced an opportunity, this is what enables them, and it is really responsible for their success. And so, for me, these two decisions unwavering faith and extraordinary effort, I made those on that very first day. I committed to Jesse that I would maintain unwavering faith that I can achieve this thing that not only I never achieved, no one in the history of our company have ever achieved. And I committed, I put forth extraordinary effort, regardless of my results along the way because I wasn’t on track along the way. I was behind most of the time and I had to come from behind. I had to keep working even though I had self-doubt. [00:12:06] Hal: My first day I went out there all fired up and I went 0 for three. I sold zero dollars so I started completely behind. Any confidence that I manufactured in training going, you know, they call it uninformed optimism, “Dude, I could do it. I could do anything. Oh, s**t. Maybe I can’t. I’ve sold nothing. Who was I kidding?” And I actually called my manager to quit on day one. I’m like, “Hey, I was talking out. I talked to the gay men. I sold nothing. I’m lame. My bad.” And I called him and he’s like, “Hal, you could do one of two things. You could give up.” I’m like, “Yeah, that’s what I’m thinking about doing. What else can I do?” And he said, “Or you could do the only thing that a champion would do, which is get back on the phone and set more appointments for tomorrow and realize that some days you sell, some days you don’t. Today was the day you didn’t. Happened to me the first day. Tomorrow you’ll probably sell big,” and the next day I sold $3,000 and it was off to the races but the point is, your past does not dictate your future. I know that’s cliché but it’s so true. And this book and what we’re going to talk about for the next 40 minutes that we got is how the subtitle of the book really tells it all. It’s the two decisions that move your biggest goals from possible to probable to inevitable and that’s what this is about is how do you take your biggest goals, your biggest dreams, the most significant and meaningful outcomes that you would create for your life and move them from being a possibility which anything is possible. I don’t care about what’s possible. The people that want to achieve what’s possible, they pursue what’s probable. We don’t pursue that which is unlikely. When was the last time, Brad, that people set goals they’re like, “I don’t think there’s very little chance of me achieving this so I’m going to give everything I have.” No. Like, we need probability and so this is how do you take these possibilities, these grand visions for your life and move them into the realm of probable so you actually have traction to start moving forward and then how do you move them from probable to inevitable so that your success is virtually guaranteed in a matter of time? And that’s really that’s where we’re going with this. [00:14:04] Brad: Awesome. Let’s unpack the word, miracle, because that can mean a lot of different things to a lot of different people and one of the things, I love at the beginning of the book is you actually define there’s two types of miracles. And so, can you dive into what those are and when you define the Miracle Equation, what that actually means, the middle word there? [00:14:23] Hal: Yes, it’s a great starting place. So, yeah, miracle is a loaded word and I think that the first type of miracles is what I would call passive random miracles and this is how I think most miracles are viewed and it kind of gives miracles a bad name or a bad rap if you will and that is that miracles are viewed as this passive random act where it’s like, “Oh, I’m going to pray and wait for a miracle or hope to win the lottery or hope this thing happens. I’m going to sit back and passively just wish and want for this thing to come to be.” And the problem with that is it’s not – so that’s kind of a passive miracle. It doesn’t. We don’t have any control over it. It’s unreliable. It’s not trustworthy. It’s pray and wait strategy, cross my fingers, and hope. The other type of miracle is a random miracle, which is like when you hear these miraculous healings or like they’re in the book I talked about the story of a gentleman who jumped out of an airplane 14,000 feet to skydiving. His parachute never opened and he bounced off the ground and he lived. We call that a miracle, right? But that doesn’t help you or I create what I would call in the book I call it your tangible, measurable miracles like that’s what we’re after. We’re not after these high-in-the-sky, passive, or random acts. It’s no, no, no, I want to create tangible, measurable miracles and here’s how I define a miracle in the context of this book and in what really the kind of miracles that I think that we would be after and it is any meaningful outcome outside the realm of what you believe is probable for you. And I’ll say that again, I’m going to break it down. So, any meaningful outcome outside the realm of what you believe is probable for you. So, I said probable because possible, again, like I said is not what we pursue. If you’re an optimist, you’re part of the optimist club, you believe in the optimist credo which is anything is possible. But like my manager said, “You don’t even know what you’re saying like you don’t even know what that means or what that would take. You’re just talking whatever,” and so that was my uninformed optimism. And then what I did is what most people do which is like, “Okay. I can do it. I went out. I went 0 for three. Three appointments, thought for sure I’d make some sales, made no sales, and that is where my faith went out the window. And I was like, “Oh, I was kidding myself,” and that’s what most of us do. Most people aren’t even willing to step out on the faith and they just stay in their comfort zone and our life stays the same. [00:17:40] Brad: And in the sales industry, obviously, all three of those prospects were unqualified. It wasn’t your fault. [00:17:45] Hal: No, it wasn’t my fault. Exactly. [00:17:46] Brad: That’s how we start to compartmentalize that stuff to make it okay. [00:18:01] Brad: So, as you’re going through the miracle, now we’re really defining it as, okay, here’s how to make these like you tell a story, you were trying, I like to use this story because it applied so much to financial services. You’re early in your career at Cutco and there was this like $20,000 sales goal. You’d hit it twice there. Nobody that had ever hit it three times in a row. It was a 14-day sales period and you’re like, “Great. I’m going to go get this thing,” and then all of a sudden they’re like, “Well, this one’s actually only 10 days.” And so, by your definition of miracle, that’s a miracle to be able to hit the $20,000 sales goal and now a much reduced time window. And my question is, okay, now that you’ve defined what this new version of the miracle is, now it’s the extraordinary effort. Can you start to define, okay, well now I conceptually think I can do this but now it’s actually executing on that and what does that look like? [00:18:54] Hal: Yeah. And what the story you just alluded to that was the origin of The Miracle Equation. That’s where I came up with it, where I named it. I was trying to hit the sales goal in 14 days and no one ever done this before and to your point, the only thing I’ll correct what you said is I was like, “Hey, all gung ho. Let’s do it.” It was much more like, “Oh my God, how am I going to do this? The odds of me being able to hit this a third time in a row. It’s never been done before. The first two times were luck. Yeah, that’s what happened,” but when we usually achieve extraordinary results, we end up pointing to luck because it’s like, “Oh, man, if that customer wouldn’t have called me at the last minute and if that lady wouldn’t have her sister-in-law also need a big financial service.” It’s like if all that wouldn’t have fallen in place. I got lucky like I can’t predict those things happening again. So, I went into that third period like I spent a week or two leading up to it in my mind going like getting myself committed like, “I can do it, I can do it, I can do it. Come on. You can do this, Hal.” It’s possible. You can do it. So, I got this all fired up. And then few days before the sales contest started, I went to my meeting, my sales meeting and our manager that, “Hey, everybody, just letting you in case you’re not aware remember that the conference got moved back four days so you don’t have the full 14 days now. You don’t have the full 14 days. You have 10 days in case you want to adjust your goals accordingly.” And my heart sank to my stomach because I just spent weeks fired like I can do it in 14 days and I’m like, “No, no, no, no, no, no, no, no, no, no, you’re not taking away 30% of my time period.” I raised my hand and I said, “Hey, Frank,” I asked my manager, I said, “Now tell me, because this is only 10 days, this doesn’t count towards like records and stuff like sales records like we don’t get the full 14 days?” He goes, “Hal, sorry. This still counts. Whatever you’re planning on, you got to do it in 10 days.” There’s no way and I went home that night and essentially, I was just trying in my head going, “What am I going to do?” Just filled with fear and self-doubt like there’s no way. [00:20:53] Hal: Fourteen days felt almost impossible. Ten days feels impossible. And then I remembered something and there’s an entire chapter on this topic in the book and the idea is to remove our fear of failure, removing your fear of failure. I remember something that one of mentors, Dan Casetta, who you know Dan from Front Row Dads. Dan taught me this and I believe this is a lesson that he learned from his mentor, Jim Rohn, and to paraphrase the lesson, it’s the idea that the real purpose of a goal is not to hit the goal. The real purpose of a goal is to develop yourself into the type of person who can achieve bigger and better and more meaningful goals. And it’s based on the idea that whether or not you hit a goal is much less consequential and beneficial to the type of person that you become in the midst of your pursuit of a goal. So in other words, if you set a goal and you give it everything you have with more discipline, more conviction, more clarity, more consistency than you ever have before in your life, whether or not you hit that goal is really inconsequential to the person that you become by approaching that goal that way with that level of commitment. And so, I thought, “I can buy into that.” What if I like just give it everything I have to sell $20,000, even though knowing the odds are I probably won’t like statistically, I probably will not hit it but what if I don’t let that enter my mind space? Like what if unwavering faith is my mindset where I just decide that no words are allowed to come out of my mouth other than I’m going to give it everything I have to reach this goal until the last moment regardless of my results. There is no other option. Like that was my mantra.” I am committed to give it everything I have to sell $20,000 in the next 10 days, regardless of my results along the way. No matter what. There is no other option.” And I wrote that down on a piece paper. I kept it in my pocket and I read it probably hundreds of times during those 10 days. [00:22:54] Hal: And this is how you make unwavering faith from this elusive concept of, like, pray, and wait, and have faith that things are going to be okay to know you’re having faith in yourself and faith in your commitment to giving it whatever it takes. And what we focus on expands, what we think about is our reality. I mean, these are old timeless adages. And so, the idea is when we are working towards a goal and we’re not on track for that goal, seeds of doubt and self-doubt and fear are planted and then we focus on the doubt like, “Oh yeah, I’m not on track. What if my next appointment goes just as bad as this one did? What if my next quarter is just…?” What if? What if? What if? What if? What if? What if? And that becomes our reality and we can’t help but our mindset affects how we feel and the actions that we’re propelled to take or not take. So, typically, when we’re working towards a goal and we’re not on track, the faith that it’s possible or probable goes out the window. When the faith goes out the window, the effort goes out the window. I know you asked about effort so we’re going to transition into that. [00:24:22] Hal: It’s not rocket science. [00:24:24] Brad: You can get back at the end and say, “I didn’t put in the effort.” And one of the things this is page 149 you’ve got a quote from Muhammad Ali, “It’s lack of faith that makes people afraid of meeting challenges, and I believed in myself,” and what I love how you open this chapter is you got all of these examples. People we all know, Dr. Seuss, 27 publishers passed on his first book. Babe Ruth had 1,330 strikeouts but also had a home run record that stood for a few years, and Walt Disney fired from a newspaper because he had no good ideas. So, I just love that there’s a lot of people that have they given up the faith early on, they would have never become who they are and who we know them to be today. So, I love that starting with the faith. Now, let’s go and flip over into how you break down the execution when you went 0 for three and keep battling through. [00:25:18] Brad: Hey, Blueprint listeners, I have a special opportunity for you this week. I wouldn’t interrupt the middle of an interview otherwise. We are hosting an event at AE Headquarters, May 19 through 21, literally right around the corner. It’s focused on how you as a financial advisor can make the leap from traditional old-school marketing to the new digital frontier. We’re going to discuss real-world tactics from our top clients from across the country when it comes to these new strategies with Facebook ads and other digital marketing tactics. Our top offices are currently delivering prospects to their live events and even better, you may be able to completely eliminate dinner bills from your marketing budget as many of them have. Here’s a bit of what we’ll cover at the event. First, we’ll have Jonathan Musgrave. He’s the CEO of the digital marketing firm that is consistently filling our advisor’s events with 40 plus prospects per evening. Incredibly, they’ve only missed on this four times in over 400 campaigns the last three years. And all attendees are being invited directly from Facebook ads with an online registration and automated trip process to an educational event with no dinner being served. During the event, you’ll get full transparency on exactly how they’re doing it including a little known tactic Facebook calls a lookalike audience you can utilize on Facebook to clone your top clients. Then of course once you get a qualified prospect to show up, the next obvious question is how do I convince them to book an appointment? That’s where Pat Quinn comes in. His experience as a professional consultant and speaker has helped world-famous personalities ranging from Olympic athletes to New York Times best-selling authors and countless attendees worldwide to master their presentation skills and captivate audiences. He’ll cover not just the tactics but also the framework behind motivating an audience to take action. Lastly, we’ll have two of our top performing offices which gathered 233 million and 97 million organically in 2018 share their tested-in-the-trenches methods to building a true financial services business, a business that operates whether they happen to be in the office or not. [00:27:15] Brad: They’ll cover real-world marketing ROIs for public events, radio, TV, how they consistently keep their advisor’s calendars full with qualified prospects, and the key to building their proprietary appointment system and client deliverable so you can clone yourself, the advisor, and scale your firm. Essentially, talking through that transition that’s so hard to make from salesperson or asset manager to a true business owner and CEO. If you’d like to see if you qualified to attend, you can fill out a short application. We’re talking less than five minutes at BradleyJohnson.com/TheCatalyst and for those that qualify, we’ll cover the cost for you to attend including flight, hotel, and tuition to the event. We’re willing to invest back into you for those that make sense for future business partners. And who knows? Maybe even we’ll crack a nice bottle of wine at my house. Added bonus, right? So, go fill out the application at BradleyJohnson.com/TheCatalyst to save your spot and I will look forward to the opportunity to meet a few of you face-to-face. [00:28:16] Hal: Yeah. So, the second decision is to maintain extraordinary effort, and my job or my objective in the book is to help you make extraordinary effort feel ordinary and the idea is so extraordinary effort here is the simplest way to do that. It’s kind of defining. Extraordinary effort doesn’t mean hustling and grinding and Gary Vaynerchuck-ing 80-hour-a-day-like work days. Extraordinary effort in one word is consistency and you look at that. That’s how you move your biggest goals and dreams from possible to probable to inevitable is consistency. So, if you do one thing each day that moves you in the direction of a specific meaningful outcome, in the book I call it your mission which is like, okay, we’ve all got lots of goals but what’s your mission? And your mission at any given time, it doesn’t have to be your mission in your entire life. You can have a life mission but it can be your mission this month or this quarter or this year. Usually, for me, I’ve got an annual mission or at any given time like right now my mission is to get this book in the hands of, well, over a million people and that’s to start and I did that with my first book. My mission was that I will maintain unwavering faith that the miracle morning can change the world and by changing like one person at a time and I will put forth extraordinary effort until I’ve changed over 1 million lives one morning at a time. And once the book reached over a million people, which took me about seven years of promotion and over 300 podcast interviews and over a dozen television interviews and radio interviews and over 100 speaking engagements like that’s extraordinary effort. [00:29:53] Brad: Let me hit the pause button right there because what’s really interesting actually it’s you went actually to the page I had open right here. So, for those of you joining us on video, that’s your book sales. When was that starting? 2012 to 2015, that’s how Miracle Morning book sales and you see the graph starts really small there on the far side and then ramps. And I remember you sharing with this. I think this was the first dads retreat kind of your book promotion strategy. A lot of our clients, a lot of financial advisors out there written a book, and they do the what you call the sprint, this massive book promotion and then after a month then they’re done. Can you share your strategy that relates to your podcast that you’re just talking of more the marathon approach to promoting a book and what that looked like? Because I think there’s a lot out there that can benefit from that. [00:31:35] Brad: Yeah. And think of our time it takes to write a book. [00:31:38] Hal: Yeah. Exactly. And that’s the thing is you should be promoting a book longer than writing the book. If writing the book took a year, promote it for three or 10 or whatever. That was my commitment was I will promote this book, until and then that’s a really important word. When it comes to The Miracle Equation, it’s establishing and maintaining unwavering faith. It’s maintaining extraordinary effort and until. And you want to circle that word and underline it three times because one of my favorite quotes, philosophy, whatever you call it, but it takes 10 years to be an overnight success and I love that. It’s the idea that you see these people. In fact, someone was interviewing me yesterday. Who was it? But anyway, they said, they’re like, “Hal, you’re kind of like an overnight success. You’re like nobody knew you,” and then my first book came out 2006. It sold like a few thousand copies over like six years. Nobody knew it and then the second book came out and now sold a million copies. So, overnight success but it’s like, “Yeah, but you didn’t see like The Miracle Equation, for example, that push period, that sales contest where I made this up, it was 19 years ago but I’ve been teaching this for 19 years and now I’m going to be on The Today Show. I don’t know if you know that yet but I just found out. I’m going to be on The Today Show next month or June, two months. [00:32:47] Brad: Awesome. Congrats, man. [00:32:48] Hal: Thank you, man. When I found out today, I was like crying all day trying to tell people. [00:32:53] Brad: That’s a bucket list item. [00:33:40] Brad: Well, I love that, well, I mean, you just defined consistency right there and every person of success that has ever crossed my path, everybody wanted to be this magic pill of, “Oh, like I won the lottery and life is good.” No. Nobody sees the hours of podcast you put in before that. It’s like the NFL athlete. Nobody sees them in the gym three times a day lifting. They just see them out on the field. [00:34:03] Hal: Yeah. Not knowing if they would ever get where they wanted to go like we have no guarantee of success. These two decisions don’t guarantee anything. They just move you closer to where you want. I’m sorry. Go ahead. [00:34:13] Brad: Yeah. Well, let’s speak to your book promotion because what I love is, number one, it speaks to the consistency of extraordinary effort which defines The Miracle Equation, but also many of the people listening in have either written a book and probably not promoted it very well or want to write a book someday so like can you speak to the consistency? What was your podcast regimen as you were building up The Miracle Morning? And maybe even if you want to dive into with The Miracle Equation, how has your promotion strategy evolved and what’s the plan on that front? [00:34:41] Hal: Yeah. Absolutely. And let me say this before I go in the back because I realize I’m long-winded, obviously, but I want to say this on the extraordinary upper part. So, I mentioned, consistency is the simplest way to mention it. If you do one thing each day that moves you closer to your goals, you’re going to eventually get there just as a matter of time. But here’s the specific take away from this, it’s what I call the power of the process and I created this when I was in sales. I realize that most of us are addicted. We’re emotionally invested or addicted to our results. So, meaning if we have bad results, we then don’t feel good about it. We feel bad about it and it affects our level of motivation or drive or energy and it usually affects our level of commitment to the process that produces those results. So, the idea is that every result, every outcome that we’re after, every meaningful, tangible, measurable miracle if you will, is preceded by a process and the process is what produces the result. Like you said, it’s the athlete in the gym. It’s not glamorous. It’s not fun. It’s not exciting. There’s no guarantee your process is going to pay off or when it’s going to pay off. But the secret to success is to define and predetermine your process that will make your success inevitable. So, for example, if you want to lose weight, well, then you have to know that unless let’s say you have like a genetic defect or something, that essentially if you burn more calories than you take in, you will lose weight. You will burn calories. You’ll burn fat. You’ll lose weight. Your success is inevitable if you increase your exercise and reduce your calories. So, when I was in sales, that’s what I did and this is applicable if you’re in business, financial advisor, etcetera. I realized I wanted to double my income from one year to the next. This was a real Miracle Equation here. I want to double my income and therefore I had to double the results of my sales and that scared the heck out of me. Anybody listening if you’re like, “Yeah, doubling my best year ever,” I was one of the top reps for five years and then decided I wanted to double my best. So, already, my best previously was one of the top in our company and I want to double it and it scared me that, yeah, that was so intimidating. So, sure enough, that year and that’s the thing is the process wasn’t intimidating because 40 calls a day was doubling my income? Scary as hell. Doubling my phone calls in a day? Super simple, not scary at all. So, all I did was I define my process, I doubled it, and that year I doubled my income and doubled my sales. And so, in the book I talked about that. We would break down, okay, what’s your mission? What’s the single most important meaningful goal that will enable you to become the person that you need to be, that can create every other goal you want for your life by developing the qualities and characteristics that you need to achieve more than you ever have? So, that’s kind of the first piece. And then, okay, now let’s define what is the process that will virtually guarantee that mission becomes inevitable. You can’t fail once you got a process in place that produces the result that you’re after right. So, that’s how we make extraordinary effort very ordinary and very predictable in the book. [00:38:33] Brad: It’s so funny how working in financial services, it can be a very complicated business, but when you actually simplify it which is what I heard you just define right there, you backed in to, okay, well, here’s doubling income. Very scary. That’s like the lag goal. That’s the end goal. So, what’s the leading measure to that? Well, I can just put in twice as much effort here. That’s the same thing we do. We’re like, “Okay. Well, how many first appointments are on the calendar in financial services? And after you double that, if everything else being the same, everything else doubles on the back end, now, that might be adding an advisor or two, it’s not that tough to figure out what actually creates it. It’s the work that goes in to make it happen. [00:39:11] Hal: Sure. That’s what I say, right, success is simple, not easy. You actually have to do it, but it’s simple. [00:39:16] Brad: So, what was your podcast regimen for the book promotion starting out? [00:39:22] Hal: So, it was anyone that would ever have me on their podcast. I was on any and every podcast. I wasn’t like I was shooting for the big ones. In fact, if you’re a new author, I don’t recommend you shoot with the big ones. I recommend that you start out at the bottom because you want to get really good practice. In fact, I’ve been doing podcast interviews for, you know, I’ve done over 300 podcast interviews now and most of them about The Miracle Morning or about my story. When I did, I just started doing Miracle Equation podcast interviews like a month or so, a month ago with the new book coming out. And the first few I did even though I’m like a very seasoned podcast guest, I didn’t have my messaging down because I never explained this new concept before really in this way. So, it’s like every interview I did, I got better and better and better and better and better and understood, oh yeah, this is a clear way to articulate this lesson or this story or whatever. So, first and foremost, start out with being on anyone’s podcast that you could be on and here’s my ninja strategy for how to find podcasts to be on. If you go to like if you look at the top podcast, they get inundated with requests, right? You know, the John Lee Dumas and Pat Flynn and Tim Ferriss and Aubrey Marcus and these guys get inundated with requests and so, therefore, they are extraordinarily selective. That’s why they have Shaquille O’Neal and Jamie Foxx, world famous people in their podcast because they’ve got such a big reach. What I did and this is the ninja strategy is go to iTunes New and Noteworthy, choose the categories that are relevant to your books that are reaching the audiences that you’re trying to reach. Go to the bottom of the New and Noteworthy. And here’s the point. New and Noteworthy means they are a new podcast that is getting some traction. The fact that they’re new means they’re probably not get inundated with requests because they’re new. They’re not an established podcast that everybody’s trying to get on. However, they’ve got some traction so you’re not just going after somebody that no one’s listening to but they’re probably looking for guests. They’re new and start at the bottom and work your way up. And it’s a numbers game. “Cool. I’ll send you an email with this little paragraph that you can literally copy and paste just to make it super simple and send email introduction but your work is just put the person name and email, put my name and email and then just copy this and intro us and you can import out of it. Would that be cool?” And they say, “Yeah. That’s totally fine,” and that’s how every time and I would get referred to two or three or four podcasts every time I did a podcast. So, those are two kinds of strategies on how I got started, and then eventually, I got on a semi-big name podcast and I was able to name drop that to the next one and the next one and then eventually I got on, you know, now I can get on bigger and bigger podcast. So, that’s my recommendation and, by the way, I’ve invested well over $10,000 to get on national TV shows. It doesn’t move the needle in book sales. Now, the benefit of it is credibility. You get your video put on YouTube and it’s like, “Oh, when somebody goes on YouTube or googles you because Google owns YouTube. YouTube videos rank high so if you can say, “Brad on The Today Show,” or just whatever like for me, I did mostly local. It was like Good Morning Albuquerque or Good day, Sacramento. [00:43:24] Hal: But still, to see your face on a TV show with guest, there’s a perceived value people going, “Wow, that’s great.” So, I did something called CelebrityLaunchpad.com I believe is the website, Celebrity Launchpad and it’s like speed dating with media people. So, you go to this event, you video Skype with like a dozen TV producers and you basically pitch yourself and then they decide if they want you or not. When I did that, I got on like that’s where I got on like nine TV shows in one day because we Skyped, they liked me, they booked me, and then that led to other stuff. So, it is worth it in terms of when I say it’s not worth that, I mean, the ROI is you’re not going to sell enough books to make that money back right away, but to me, it’s worth it to have those videos online and on your website and that sort of thing. But the bottom line is that’s a bonus strategy. Podcast is the single most effective way to move books. And my theory on that is people at home watching television, they might be making breakfast while the TV is on the background. They may not read books at all, right? I mean, in fact, just like only likely 5% of our society give or take that read self-help books or business books, however, if they listen to podcast by definition, they pursue personal development and they’re usually on a device, such as their phone or computer where they can immediately order a book. So, that’s my recommendation and it cost you nothing to get on those podcasts if you just reach out and ask. So, that’s a recommendation for book promotion is to just do as many podcasts as you possibly can. [00:44:49] Brad: That’s so good. If you’re an advisor out there and you need to like skip back about five minutes and relisten to that because that’s – and what’s interesting, I’ve used a similar strategy for booking guests on my podcast and it’s so true. You’re well-connected in the author, the thought leaders space, you know five people that would make great guests and that’s basically organically how my guest list has come to be. [00:45:12] Hal: Yeah. I’m sure I probably introduced you, I don’t know, Vroman, or I don’t know. I’m sure I’ve introduced you to some people in the past to be guest in. [00:45:16] Brad: Yeah. Okay. So, I’m looking at the clock. We’re getting close here. [00:45:20] Hal: We got seven minutes. [00:45:21] Brad: One quick question and maybe if we can convince this and I know you got a special gift here for the audience. I want to make sure we get to that. How has your strategy evolved with promoting this book versus The Miracle Morning? Any different tweaks that you’re doing? [00:45:35] Hal: Yeah, some big ones. So, I hired a book launch manager for this one. I’m more, more, more realizing that I got to stop trying to do all things myself and bring the experts in that are better than me. Not to mention it’s just taking it off my plate, I go, “Man, I don’t want to be the point person. I want a point person to help with this.” So, I hired Tim Grahl, G-R-A-H-L. He wrote the book, Your First 1,000 Copies, and he wrote the Book Launch Blueprint and I’m so happy I hired him. That’s been going great. Here’s his general strategy. His general strategy is basically quality over quantity, meaning instead of emailing everyone you know and being like, “Hey, will you please promote my book?” Yes, you don’t ask them to buy your book. Of course, that’s a given. But instead of emailing everyone and be like, “Hey, here’s like a little copy and paste and send this out to your entire email list or your social media or whatever,” the idea is you guys can reach out to the people in your circle of influence that they basically meet the sweet spot of they have the biggest reach and you have a relationship with them. So, I had to get out of my comfort zone and I reach out to people that I have a, you know, some of them I don’t have like a super strong relation with but I was like, “I hope they would help me,” like Aubrey Marcus is someone who I helped him in his book came out just because I believed in his book. I read it and I was like, “This amazing.” I reached out to him. I’m like, “Dude, I want you in my podcast, please. I’m going to share this book” and in my Facebook group, this and that, but he and I aren’t really close and we all have our own, I have that high school voice in my head like, “I’m not one of the cool kids.” And so, I was like hesitant to reach out and it was like Chip Franks who’s on my team and he’s like, “Dude, you got nothing to lose. Hal, go ask him.” I’m like, “You’re right. I’m so silly. Follow my own advice.” And I reached out and he’s like, “Yeah. Totally. I’d be on.” I’m like amazing and then Chip was like, “Hey, did you reach out to James Altucher?” I’m like, “I don’t want to bug James,” and he’s like, “Just ask him.” And I ask James, it’s like, “Of course. I’d love to have you on.” So, I flew out to New York and did James Show. It’s like everyone I asked, help me out. He said, “So, your book can be the best book in the world and they’re going to go, ‘I’ll add it to cart, and I’ll get to it when I have time.’ Unless you give them a reason like, ‘Hey, actually, if you buy it today, I’m going to make it so worth your while,’ that it’ll move it up on the priority list.” So, the idea is he said, “I want you to create over $1,000 in brand-new real tangible high-value bonuses that people get only when they order your book during the preorder or the day it comes out phase.” I was like, “All right. So, it’s a great idea.” So, anyone that orders the book right now, if you go to MiracleEquationBook.com that will redirect you to Amazon and it does anywhere, any country that you’re, if you’re in a different country, you go to your Amazon page in your country, but MiracleEquationBook.com or you can buy the book anywhere books are sold like Target.com, Walmart.com, Barnes & Noble. [00:49:27] Brad: Or I’m just going to buy a bunch of your books and give them away to people. [00:49:30] Hal: There you go. Get it from Brad. Be on Brad’s good list and you’ll get a miracle in your mailbox. [00:49:37] Brad: The miracle in the mailbox. That’ll show up on the next podcast that you’re iterating right here. [00:49:42] Hal: There you go. So, here’s what you get. You buy the book today, please. Thank you. I really appreciate it. It will help you but you forward your receipt, your email receipt, to miracleequation@gmail.com. That’s miracle equation, make sure there’s two Es in the middle. People misspell it sometimes and leave out one E. It’s miracle, ending in an E, equation, beginning with an E, @gmail.com. You will get over $1,300 in bonuses automatically be enrolled when you forward receipt and the bonuses are, first and foremost, is a course, a six-week live online course with me that starts the week after the book comes out that is called How To Create Tangible, Measurable Miracles. That’s a Miracle Equation course. That’s worth $1,200, $1,199. You’ll get a guided meditation that will help you through my voice to embed these decisions in your subconscious so that they become part of your thinking, in your way of living, and you acclimate these decisions. [00:51:10] Brad: And they don’t get to meditate to your voice in the morning. [00:51:14] Brad: I’m in. All I need is that. I need the one gift meditate to Hal’s voice in the morning, I’m in. [00:51:19] Hal: Good miracle morning, Brad. Open your mind. Take a deep breath. [00:51:444] Hal: The book launch team? [00:51:45] Brad: Yeah. With the texting because basically, I was getting text on my phone about your book promotion. [00:51:51] Hal: Is that – those are the launch team text I think. [00:51:52] Brad: Oh, the launch team. [00:52:38] Brad: We’ll throw out in the show notes if we need to as long as it’s live. I guess. [00:52:42] Hal: Yeah. So, basically, it’s forming a launch team. The point of the launch team is to get them to leave Amazon reviews on the day the book comes out so that which gives your book more credibility. So, you send them an advanced copy of the book before the book comes out and the advanced copy could be my publisher send out hardcovers. When I’m self-published, I send out a PDF and that way people can read the book in advance and then the day the book goes live, they log into their Amazon account and they write a review and then that way we’ll go see the book that first week, but you’re pushing it and promoting it. They go, “Oh, wow. There’s already 30 reviews,” or whatever so people actually and then they read reviews and, yeah, it looks like that page is live. So, if you go TheMiracleEquation.com/launch/team and it’s too late to join the launch team, but I think you can join it. You probably it’s the automated stuff and then also you ask them to promote in social media. [00:53:28] Brad: Tim set all that up on the backend if people want to connect with him for book launch? [00:53:32] Hal: Yeah. Totally. Tim’s amazing. Been a great investment to work with him. [00:53:36] Brad: Cool. Well, Hal, I’m going to let you run. You got a super busy schedule. For those out there watching the video, The Miracle Equation right here. Go grab a copy and get a ton of additional other resources, live course with Hal. So, Hal, awesome as always, man. Look forward to the next time our paths cross. [00:53:52] Hal: Thank you, Brad. Appreciate you as always. Dude, thanks for having me. [00:53:55] Brad: Yeah. We’ll see you, bud. [00:53:56] Brad: Good luck on the launch. Bye. [00:53:57] Hal: All right. Bye. [00:53:58] Brad: Thanks for checking out the latest show. On to this week’s featured reviews. This week’s first review comes to us from Daniel out of California who says, “Thankful. Five stars. Brad goes above and beyond. Whether you are a seasoned or new advisor, I know you’ll find value in taking the time to listen to some of these podcasts. Brad knows and understand advisors, our pain points, and provides actionable ideas that will immediately add value to your business. Thanks again, Brad, for all you do. Daniel, HB, California.” Hey, Daniel. Thanks for listening in and the kind words. Working in this business for over a decade now I like to say that I get the opportunity to have an accelerated learning curve because I have this 30,000-foot view of some of the top independent practices from all over the US. So, if I’m able to share what works and what doesn’t without you having to trial and error it or waste a bunch of marketing dollars testing and proving ideas, I’m thankful to be in a position to be able to help. So, thanks for taking the time to share your thoughts and for the review. The next review comes to us from Tcs26mar who says, “Best podcast for growth in the insurance industry. Five stars. Every episode seems to get better and provides valuable resources for advisors building their practice. As other reviewers have mentioned, would love to have a weekly episode that understands quality over quantity. Would love for you to have some of the Catalyst speakers on the podcast.” Appreciate the review and it’s good to hear the show keeps getting better. I’m not going to lie. I cringe a bit when I listen to my early episodes so I’m glad I’m getting better as the show progresses and I’m working on some cool ideas on how to add even more value to the show, maybe even more frequency including opening up some of our behind-closed-doors trainings a bit like the Catalyst that are typically reserved just for our clients. So, stay tuned on that front and more to come. [00:55:44] Brad: Next up is user BigBlue0615 who says, “Great fit. Five stars. I find myself being drawn towards listening to more podcast in general whether in the gym, driving, etcetera. Brad’s is a great fit for an advisor like myself looking to expand my potential and learn from credible experts. Great topics and discussions to look forward to more.” Thanks for listening in and for the five-star review. Super appreciate it. I found it’s common. It’s really a theme with the most successful people I know. They tend to be lifelong learners and not only that, but they find ways to continue to grow and that often means fitting in podcast at the gym or on their drive to the office so well done on that front. And I also appreciate you taking the time to share your thoughts. More episodes on the way. And the last featured review for the week comes to us from ChrisHansenCFP who says, “Awesome podcast for all financial advisors. Five stars. Brad Johnson hosts one of the best podcasts I have found for financial advisors. I’ve been in the business for 26 years and I find every episode loaded with tons of information relevant to my practice. I think you’ll find Brad and his guests’ insight valuable regardless of your business model. I’m an avid consumer of financial advisor podcasts. I found the Elite Advisor Blueprint Podcast early on and still look forward to each new episode. Brad, thanks for helping make my business more fun, efficient, and profitable.” Thanks for the review, Chris. Man, it means a lot to hear such kind words from a 26-year vet and a CFP at that. Even better to hear that our show and lineup of guests is making your business more fun, more efficient, and more profitable. That’s basically the ultimate trifecta so glad you’ve been listening since the early days and as the show grows, it’s crazy to me how new doors are opening to book more incredible guests in the future. So, stay tuned. I’ll do my best to keep delivering from my side. [00:57:30] Brad: As we wrap this show, thanks again. For those of you who have taken the time to write a quick review, I love reading in each every one and for those of you that have interest in diving deeper or figuring out how you may be able to have our team help you implement many of the ideas shared on the show, my day job happens to be consulting financial advisors from all over the US on how to grow their business and design a practice that serves them versus them serving it. Yes, it’s possible to grow your business, work less. This is a model we’ve replicated over and over in markets all over the country. So, if you’d like to apply to see if it makes sense for us to have a one-on-one conversation on how to overcome what may be getting in your way, you can do that at BradleyJohnson.com/Apply. It takes about five minutes to fill up the application so we can understand what your business looks like, what challenges you may be facing, and how myself and my team may be able to help. Taking your first step is as simple as applying at BradleyJohnson.com/Apply. So, that’s all for this week. Thanks for listening and I will catch you on the next show. [00:58:31] Brad: Thanks for listening to this episode of the Elite Advisor Blueprint. For access to show notes, transcripts and exclusive content from our show’s guests, visit BradleyJohnson.com. And before you go, I’ve got a quick favor to ask. If you’re liking the podcast, you can help support the show by leaving your rating and review on iTunes. Not only do we read every single comment, but this will help the show rank and get discovered by new listeners. It really does help. Thanks again for joining and be sure to tune in next week for another episode. The information and opinions contained herein are provided by third parties and have been obtained from sources believed to be reliable, but accuracy and completeness cannot be guaranteed by Advisors Excel. The guest speaker is not affiliated with or sponsored by Advisors Excel. For financial professional use only. Not to be used with the general public or in a sale situation. 814505 Content intended for financial professionals. Financial professionals are encouraged to seek approval from their RIA or Broker Dealer as applicable prior to implementing new marketing activities or utilizing third party vendors to support marketing activities.